The Mac gives you different ways to do the same thing: for instance, you can use a standard menu, a contextual menu, or a keyboard command to trigger the same action. So, it’s easy to overlook the fact that the various ways you can trigger a Finder search actually have different results, providing different starting points in your search window. Learn the differences, and start your searches off on the right foot every time instead of slowly clicking your way to the options you need. Most of us automatically press Command-F (for “Find”) to start a search, but the window this command opens is not always the best starting point. As with all searches, you’ll see the Search bar, which lets you define where you’re searching (the search scope) and the search type. In addition, you get a criteria bar, which lets you specify search criteria such as the type of file, or its created or modified date. The criteria bar starts out with the find-everything setting Kind Is Any, so if you don’t want to use search criteria, you can just ignore it—but it’s ready and waiting to help you narrow the search if that’s what you need. The downside of starting with Command-F, for the majority of searches, is that the Search bar in this window sets your search type to Contents, not File Name. A Contents search looks inside files for an occurrence of your search term. That’s superb when you need it, but if you’re looking for a file’s name instead, you’ll find it quicker to start with a different command. Depending on how you begin your search, you'll almost always see the Search bar (1), which lets you define the search scope (a) and search type (b). In addition, you might also see the criteria bar (2), which lets you narrow your search even more by determining, for example, what file type you're looking for. Since I'm usually searching according to a file’s name, or at least part of its name, rather than its contents, I prefer to use Command-Shift-F (otherwise known as the Find By Name command) for my simple searches. This command brings up a Find window set to look for a file name (that includes folderand volume names). Unfortunately, the criteria bar does not appear automatically, so if you want a more-targeted search, you must take the time to click the Add button (+) at the right of the Search bar to get one. Tip By default, the Finder’s search scope (where OS X looks) is set to This Mac. So, OS X looks through all of your Mac’s files and folders except those that are excluded from searches. The second choice, always in the Search bar, is the current folder—the one that you were examining in the Finder window when you triggered the Find procedure. Shared volumes may also be listed in the Search bar. If you prefer, you can switch the default scope to the current folder. Go to Finder -> Preferences, click on the Advanced tab, and select Search The Current Folder from the When Performing A Search pop-up menu. In Snow Leopard, the menu provides a third choice: Use The Previous Search Scope, which sets the scope to your last choice in the previous search. 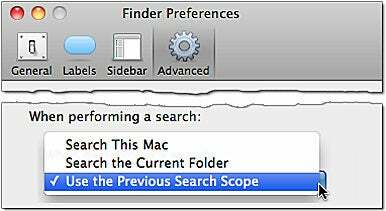 By default, OS X sets your search scope (where it's going to search) to This Mac. But you can change this setting in the Finder preferences as shown here. The option Use The Previous Search Scope is available only in Snow Leopard. There’s a search field in the upper-right corner of every Finder window, but convenient as that might seem, this provides a limited approach. When you activate a search this way, you get the less-common Contents search, as you do with Command-F, but you don’t even get the criteria bar that command provides. Since all the search approaches described here automatically activate the search field, there’s no reason to use this method. One of the downsides of using any of the search methods mentioned so far is that your current Finder window turns into the search window. That can be both surprising and annoying if you’ve used your current window to drill down through your folders for something else. While you can press the window’s Back button to return to the folder after doing a search, it’s too easy to forget that and simply close the search window by mistake when you’re done. If you’re looking for something quick and simple (whether it’s a file or an application), your best option is often the Spotlight menu in the menubar—and you can use it without first switching to the Finder. Open the menu (and activate the Spotlight field) with Command-Spacebar, and type your search term. When your search results in too many items to list in the menu, or you realize you need to define more parameters than the menu approach allows, you don’t have to start again. Click Show All at the top of the Spotlight menu to open a Finder search window with the initial results already listed. The search parameters will be set to This Mac (overriding your usual scope setting) and Contents; the search term you typed into the Spotlight field will be in the window’s search field, selected for editing. You start with Command-F for Find (which defaults to a Contents search) and then realize you want to search by File Name. Or, vice versa: you start with Command-Shift-F (which finds files by name) and then decide you want a Contents search. You don’t have start over. As long as you haven’t typed anything in the search field, press the other keyboard command and the window’s search parameters change. Mac author Sharon Zardetto is still waiting for someone to develop frequently needed search routines for items such as her car keys and wallet.